Olafur Eliasson‘s first solo exhibit in Louisiana is opened. 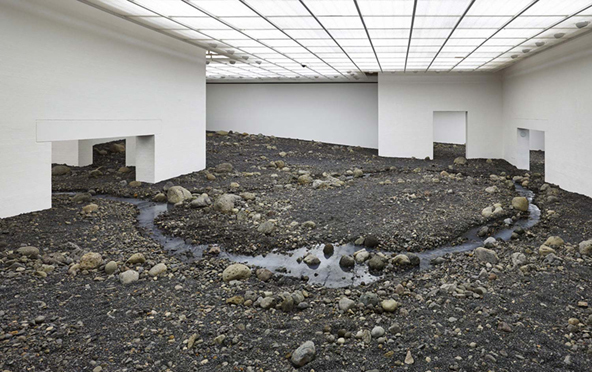 The central work in the exhibition, Riverbed (2014), which is made specifically for the museum, is based on the unique connection between nature, architecture and art that characterizes Louisiana. Three recent film works are presented in The Hall Gallery. The third station of the exhibition is Model room (2003), a key work in Eliasson’s production that is always adapted to the specific exhibition situation. Eliasson shows around 400 geometric models used in developing artworks. Louisiana, Copenhagen. 20.08.2014 > 04.01.2015.